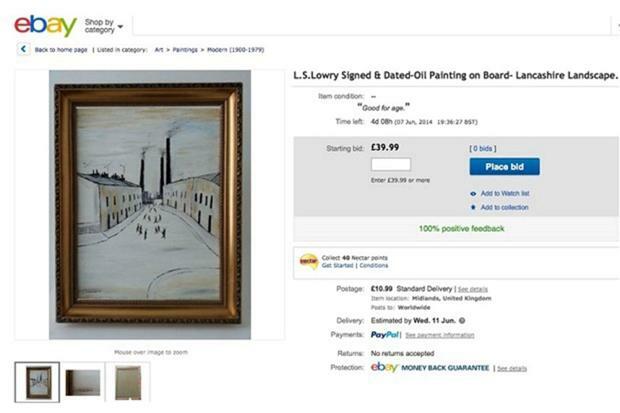 An eBay user who sold artwork on the online auction marketplace, allegedly claiming them as authentic masterpieces by artists such as Mary Fedden and LS Lowry, has been given a lifetime ban by the site. Geoffrey Spilman, from Rugby, Warwickshire, had been selling hundreds of fake paintings via eBay over the past two years – despite being arrested by police 18 months ago as well as being given a caution for forging artwork by Ashley Jackson; after the artist complained to his local fraud team. During the course of his crime spree, Mr Spilman had auctioned off approximately 280 fake paintings – selling nearly all of them. One piece of artwork, claimed to have been painted by British artist Mary Fedden, was sold by an eBay seller with the handle ‘walledgarden2013’. This eBay advert was sent by The Sunday Telegraph to the Portland Gallery – the group responsible for looking after the Mary Fedden estate. However, Mr Spilman told a photographer (working on behalf of The Sunday Telegraph) that he had not undertaken any illegal activity – saying that his artwork was not sold as the artist, but as the manner of the artist. eBay’s guidelines state that sellers should ensure their items are genuine before listing them on the site. Should a seller fail to verify the authenticity of an item, eBay cannot approve its listing.